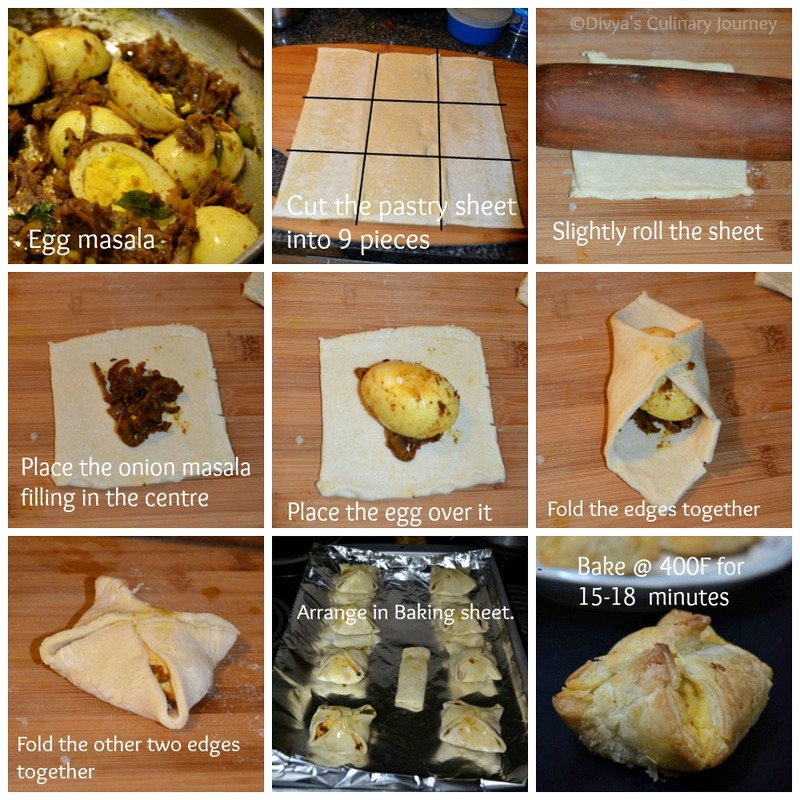 Egg Puffs are baked puff pastry with spicy egg filling. It is one of my favorite snack. Back in India, We used to get these puffs in the local bakeries. After coming here to US, I came to know it is very easy to prepare this at home with the ready-made frozen pastry sheets available here. 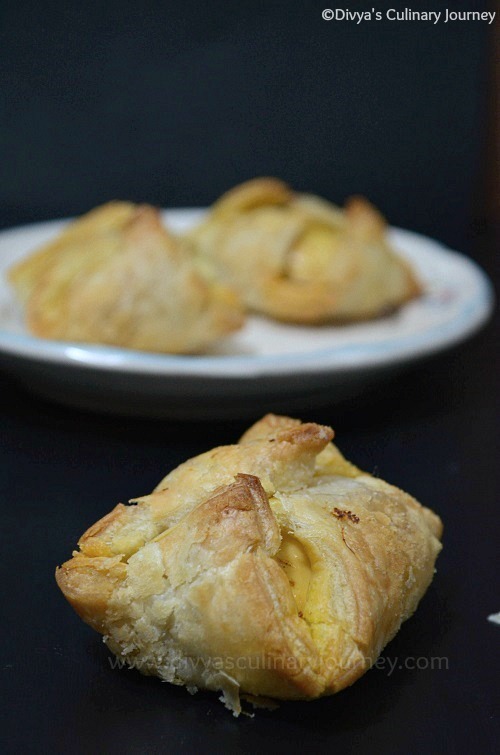 I prepared this Egg puff one evening for snack, though it was dark, managed to click pictures to post here. Thaw the frozen pastry sheet as per the instructions given in the package. Boil the eggs, remove the shells and slice it into two and keep it aside. In a skillet, heat oil, add cumin seeds, then curry leaves and fry for a minute. Then add chopped onions and fry till the onions turn translucent. Then add the ginger garlic paste, turmeric powder, cumin powder, chilli powder and coriander powder and fry for another 2 minutes or till the raw smell is gone. Add the required salt, mix and add the sliced eggs and gently mix well and turn off the heat. Cut the pastry sheets into 9 squares or according to the size you require. Take each roll and slightly roll it. Then place the masala/spicy onion filling and then egg on top of it. Pull the sides together. Then the other sides together such that the egg is covered with pastry sheets. Then seal the ends together. Preheat the oven for 400 F.
Arrange the prepared puffs on the baking sheet and brush oil on top of the puff pastry and bake for 15-18 minutes. Remove from the oven and serve it warm with tea. Adjust the spice as per your taste. Make sure you seal the edges of the pastry sheets tightly, otherwise they will open up while baking. Optionally you can brush on top of the puffs with egg white, for shiny golden color. very well preapred Divya. This is my fav. You have followed a different style to stepwise pictures. I appreciate your idea. As well as your egg puffs are also so good. 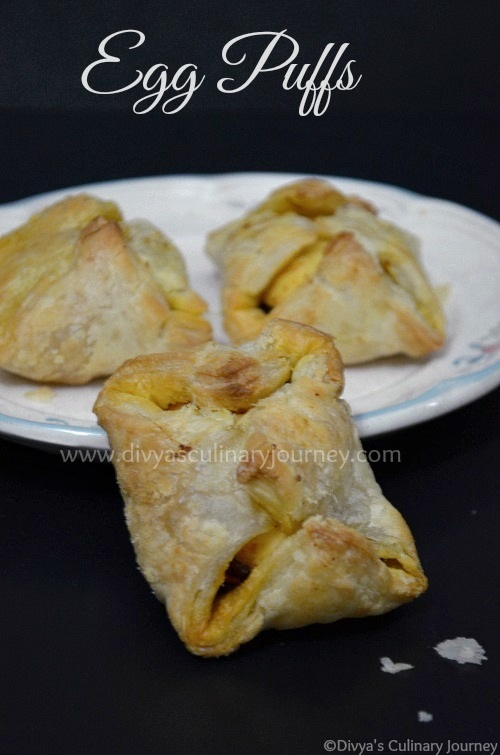 Wow they look super yummy divya ....Pastry sheets comes in handy. Yummy egg puffs.. Perfect tea time snacks..
wish i could get puff pastry here da.. it is n my to-do list for long time..
Fabulous egg pastry puffs, looks really awesome! Superb Puffs.. Very very tempting :) Used to have them so often when we were in India. Here we can bake all bakery stuffs easily but its hard to cook or taste our own Traditional & Authentic recipes right? 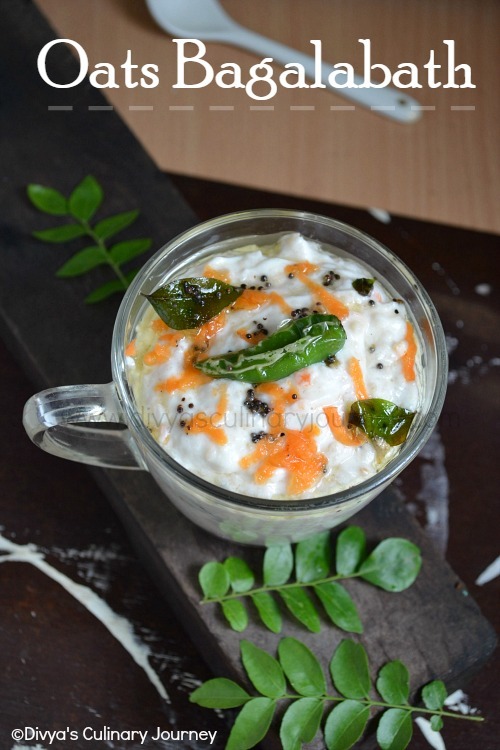 this egg stuffing is my mom's fav one...egg masala sounds so flavorful and yumm...very well done..neat pictures da ! We also enjoyed your puffs very much just 10 minutes ago :-)....thank you for sharing!